Alita: Battle Angel has been out two weeks now, and in that time it has exceeded 20th Century Fox’s expectations. 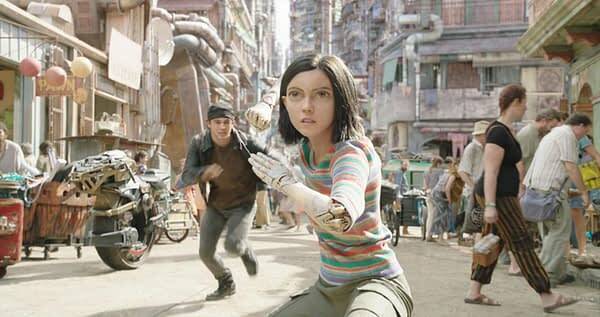 While the film has not been wildly successful by U.S. box office standards, but the film is already revving up audiences in China, which will help push international box-office for Alita past it’s current $155 million haul. There are indeed plenty of Alita stories to tell, with nine total manga collections available to inspire the film makers. And if manga sales on Amazon are any indicator, interest in Alita titles is at an all-time high, with the online giant struggling to keep up with demand for the series. Fans of the original manga and the 1993 anime adaptation have been pretty happy with Robert Rodriguez’ take on Alita, which shouldn’t be a surprise to anyone. Rodriguez is the McGyver of the film world, able to cobble together great looking movies with 48 bucks, six sticks of gum, and a gallon of gasoline. Alita: Battle Angel is currently in theaters, and it’s a lot of fun! It’s a full-tilt love letter to the source material, and definitely not the same old thing we’ve had thrown at us lately in cinemas.